“I am thankful to all of the Emerald Peek nursing staff and team for helping me gain the ability to get through the prosthesis process, and the extra effort they put into helping me get it is overall a blessing. They knew I was determined, and even when I felt like giving up the team stood by my side.” – Richard F.
“This is incredible. I cannot believe you are all doing this for me. It really does feel like I graduated. I am very grateful to you all for getting me back on my feet. This team is great.” – Michael L.
“It is amazing to me how more social and more engaging my dad is since he came to stay with you. He sings, he smiles, he laughs, he really does enjoy himself every day.” – Lynn G.
“The rehab team is so great. Mom wanted to change her rehab times and they are always so accommodating. Whether it is because we are taking her out for a visit, or because of one of the great recreation events, rehab always makes time for her. It’s because of that flexibility that she wants to participate. She’s come so far because of that team.” – Lisa G, daughter of Barbara G.
“I am so happy I came here. I am more happy that you helped me go home. I thought I would never be able to go home. Thank you for taking such good care of me. All of you were so nice to me.” – Alma A. “I am so thankful and grateful to you and the team for everything. I did not think mom would be able to get around in the house like she is. She is doing really well and we owe it all to you and Emerald Peek.” – Mary, Daughter of Mary B. “You really do have a lovely place here. I was nervous at first, and it was a lot to take in, but you (Katie C.), Sandy, Frantz and Mark, are doing a wonderful job taking care of everyone. My mom is better because she is here. I will actually be able to take her home safely now; I never thought I would be able to do that. Thank you to everyone!” – Mary N.
“I would like to express my sincere gratitude to all the staff at Emerald Peek for the excellent care I have been given. Doreen Brown (CNA) has gone out of her way to make me extra comfortable. WestLedge has held many happy memories for me as will Emerald Peek.” – Betty O.
Click to read wonderful words from the Noonan family. “Sara Delguidice, LPN, is very kind and patient. She is professional, supportive and helps us when needed. I am very glad to be able to work with Sara D.” – Karen B.
I would like to express my sincere gratitude to all the staff at Emerald Peek for the excellent care I have been given. Doreen Brown (CNA) has gone out of her way to make me extra comfortable.” – Betty O. “Basically, you all saved my life, my wife’s life, and my marriage. This process has been so hard on her too; you saved a family.” – Michael D.
“This is becoming my second home and I am so lucky. You guys take such good care of me every time I am here. I am so blessed to have all of you.” – Marie M.
“I cannot believe I am going home. I came here thinking I would not be able to go back to doing what I was supposed to be doing. I thought I would just get worse. But you, (Mark) run a really tight ship here. You make sure that everything gets done right. I am so glad that you are here and the staff you have here is great. I am going to write you a letter with all their names. They are just terrific!” – Miriam R.
“The first time I came here, I was nervous and scared. I didn’t think I was going to get back on my feet again. Now that I am back for a second time, I am not scared. I know I will get back on my feet. Of course, I will get back on my feet; I am back with all of you!” – Alice O. “Thank you for helping my son, John. It helped me very much that my son was able to deal with the amputation in a positive way; he was motivated to walk again. Although I’ve never met you, I feel like you are angels watching over him.” – Mother of John G.
Click here to read an incredible testimonial from Mr. Al Lodi! “I am really going to miss all of you. Thank you for taking care of everything I needed, even my difficult diet needs. The staff was terrific, they were kind. I am thinking about coming back to volunteer. I really love this place.” – R. E.
Click here to read a beautiful testimonial from the Koscal family! “This really is a wonderful place. You are kind and took care of me. I am happy to be going home… But, if I was going to have to go back, I would want it to be here. This will be a second home to me. God bless you all.” – Thomas T.
“What an amazing job you all did on the renovations. It’s gorgeous. Now, the building will shine just as brightly as the staff does.” – Shirley B. – Anita, daughter-in-law of Josephine L.
“I grew up around here and raised my family here. My friends and I were talking about all the changes here and how great it is to see and hear. This building is a big part of the Peekskill community and we all want the building to do well. Now that I see it from the inside, I know it will be successful, because of the physical improvements and because of the staff.” – Alice O. “This facility is family to me. You love me and take good care of me. This will be my home now.” – Shirley B. “You are making it easier to understand what is happening to me and why I am here. When I get confused, I just look in my book and I feel so much better. I even wrote down where your office is so I can come visit you.” – Richard C.
“It gets more comfortable here every day…. I am getting happier here every day.” – Santiago A. “It’s amazing to me. I am not an easy patient. I am difficult and stubborn. You guys never gave up on me. Never. Every time someone told me we would get to this day, I said no. You were right. I am lucky to be here.” – Perry E.
“Everyone here is kind. I have had some challenges and was nervous. You guys made me feel at ease. At home. Thank you.” – Bruce M.
“I am so glad you helped me get out of my room. I was so worried that I would not enjoy it that I never wanted to leave my room. I am really enjoying it.” – Gwen M.
“The staff here just gets kinder and kinder. Everyone is smiling, looking like they are having a great time at work. It’s really, really nice to see.” – Arthur E.
“Everyone was nice last time, but this time everyone is so attentive and asked me what they can do for me every day. 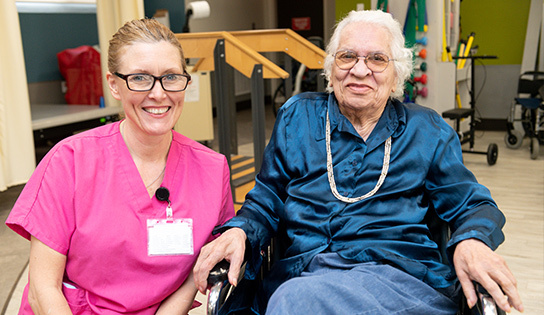 I am so happy to see the improvements and happy to be back.” – Pauline N.
“It is wonderful to see staff who were here last time that they are still here. It makes me comfortable to see staff I know. I know they will take good care of me.” – Marie G.
“They all took really good care of me. I had a really good time here.” – Diane P.
After a conversation with a resident’s family about Celiac Disease, the Director of Dietary and I talked about her diet and we brought in some unique Gluten Free food for her to try. Her son was very appreciative – “It was very kind for you and the staff to think of my mom and her unique challenge. She can get Gluten Free food anywhere. But for you to take time to find unique things for her makes this place really special.” – John L.
After showing the “No Place Like Home” video to staff – “This is turning into a place to work hard AND have fun. You in your movie director costume, Kathrin in the Dorothy costume and Mark in the Scarecrow – who does that? You guys are great.” – Gloria G.
“I am happy to be moving on to assisted living, but I will miss all of you. This has been my home for so long.” – John D.
“I know caring for my mother has been a challenge for all of you, but everyone is here so kind. You have taken such good care of her. We are lucky to have found you.” – Murat H.
“It is remarkable to think of where I was to where I am. I will miss you all, especially the staff that took good care of me.” John S.
“You guys (Mark, Katie, Kathrin) have done more events and activities for staff in the last 6 months than we have done in years. You are a good balance of keeping us in line and making us smile.” – Tina G.
“It is great that we are eating outside so often. It helps us enjoy the summer!” – Michael M.
“The barbeque you all had on Monday was really nice. I can see how much effort you put into it and I could see how much you all enjoyed it as much as we did. It was a really nice day.” – Debbie M.
“I just want to take a second and tell you how nice the staff is. They have a lot of work to do and, even so, they are nice to us all the time.” – Wilbur N.
I can’t begin to tell you what a wonderful experience it has been for my mother and family here at Emerald Peek. The phrases “wonderful experience” and “palliative care” are certainly an odd combination but it describes our past eight days. Our family entered uncharted waters when we made the tough decision to put mom in palliative care. Your amazing staff has held our hand and guided us through this tough stage of life. Mom always said she wanted to die at home we but we all know at this point it was not possible and were all feeling a bit guilty. I believe the comfortable homey environment makes mom think she is actually at home. I originally was going to name names to let you know some of the wonderful staff members who have helped us but as the week went on I realized that they are all amazing, caring individuals who truly love their jobs. They talk to my mother as if she was their mother! From the housekeepers to the CNA’s, to the nurses, to the administrators- we have nothing but praise and admiration! We still can’t get over the fact that on the Friday evening Mom moved in Susan called me with her cell number in case we needed anything over the weekend! Read more here for a beautiful testimonial from the Meier family!